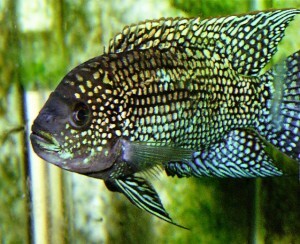 The Jack Dempsey Cichlid, named after the popular 1920’s world heavyweight boxing champion and prizefighter Jack Dempsey, is one of the most popular Central American “pet” fish. Its name is derived from its absolute fearless willingness to take on any other fish that dares to enter its territory. They also have an attitude to get aggressive, territorial and no nonsense fish if they feel cramped. However, Jack Dempsey Fish is generally a cool fish to keep provided you have enough space and you also give them compatible mates in the tank. In terms of appearance, the fish is a nice looking one. The main color of their body is dark brown to black. They also have some dark stripes running vertically over their bodies. These stripes, however, tend to be more pronounced in younger males. Their scales are dominated by a bright color ranging between bright blue to deep yellow depending on the mood and the condition of the fish. A single Jack Dempsey fish can do well either on its own or in a community of other cichlids. The Jack Dempsey Fish are perfect breeders, with the sole only problem after breeding being how to get rid of the baby cichlids. Being typical substrate spawners, the Dempseys have large spawns with parents having the responsibility of caring for the fry in the most dedicated manner. The fish can survive in temperatures ranging from 60 to 90 F, and a pH level of 6 to 7.5. This is an indication of just how hardy this fish is especially if properly fed with a varied diet. However, it doesn’t mean that it can then be subjected to such extreme conditions. Being a carnivorous fish, the Jack Dempsey always eats almost anything. They love live fish most, more so live fish. A varying diet, including brine shrimp, flake food, blood worms and certain plants are necessary.